1 An interesting blog entry about Carlos E. Rogers, a soldier in the 185th New York who died in the fighting at Petersburg on April 1, 18652, appeared at the Syracuse Post-Standard web site today. 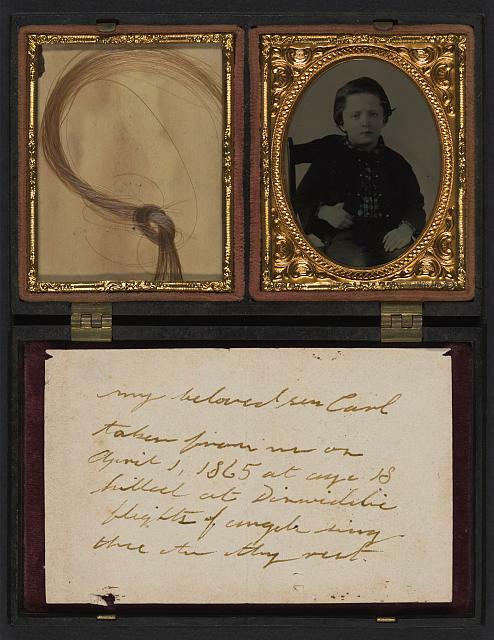 An image of Rogers as a baby, a lock of his hair, and an accompanying note from his mother were among the large group of items recently donated to the Library of Congress web site. North South Trader’s Civil War managing editor Nancy Dearing Rossbacher did the research necessary to identify the little boy in the picture as Carlos E. Rogers of Syracuse, New York. This is one fascinating story which has resulted from the donation of this collection, and hopefully reasearchers will find many more. Go check out the story. It’s well worth your time and a good reminder so near to the 150th anniversary of South Carolina’s secession that the Civil War caused many young men to give the ultimate sacrifice.